Apple says it sold more than 10 million iPhone 6 and iPhone 6 Plus models in the first three days after the phones went on sale, setting a new sales record. 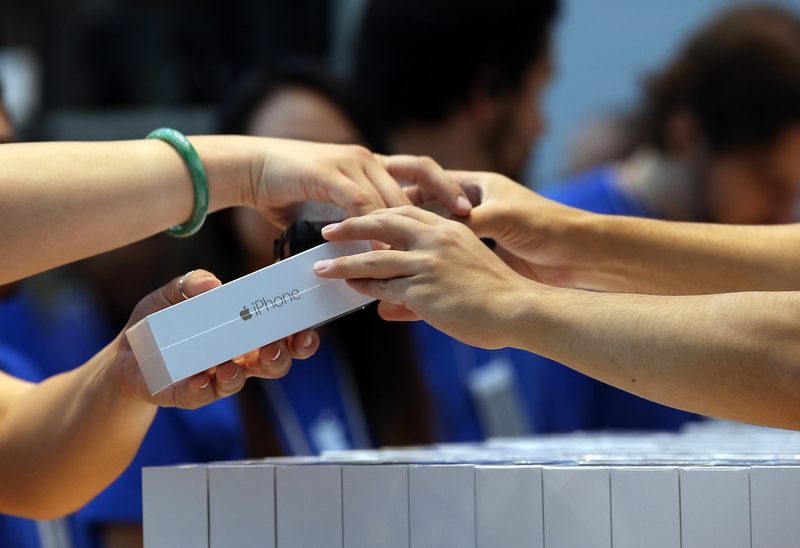 A year ago, Apple Inc. said it had sold 9 million of the then-new iPhone 5C and 5S models the weekend they launched. By comparison, it took Samsung about a month to hit 10 million sales for its flagship Galaxy 4S last year. "Sales for iPhone 6 and iPhone 6 Plus exceeded our expectations for the launch weekend, and we couldn't be happier," Apple CEO Tim Cook said in a statement. Should you upgrade to Apple's new iPhone 6? The company did not break down sales figures between the two new models, but CNET reports that according to three analytics firms, sales of the 4.7-inch iPhone 6 have far outpaced the larger 5.5-inch iPhone 6 Plus. The 6 Plus sold out in some stores over the weekend, Bloomberg News reported, and on Apple's website online orders for the 6 Plus are projected to take 3 to 4 weeks to fill. Both sizes of iPhone 6 were released Friday, Sept. 19 in the U.S. and 9 other markets: Australia, Canada, France, Germany, Hong Kong, Japan, Puerto Rico, Singapore and the U.K. Apple says they will go on sale in 20 more countries this Friday, Sept. 26, and 115 countries by the end of the year. Besides larger screens, the new phones offer faster performance and a wireless chip for making credit card payments, a system known as Apple Pay which will be enabled in an iOS 8 update next month. The larger iPhone 6 Plus also includes enhanced image stabilization technology in the camera. With a two-year contract, the iPhone 6 costs $199 for a model with 16 gigabytes of memory, $299 for 64GB and $399 for 128GB. The iPhone 6 Plus is priced at $299 (16GB), $399 (64GB) and $499 (128GB).